Pretty much everyone we know likes to start off the new year making small changes to reflect a healthy difference in their lifestyle. While I’m sure that we won’t totally cut out wine and a small nosh, especially on weekends, at least it can be a bit lighter. 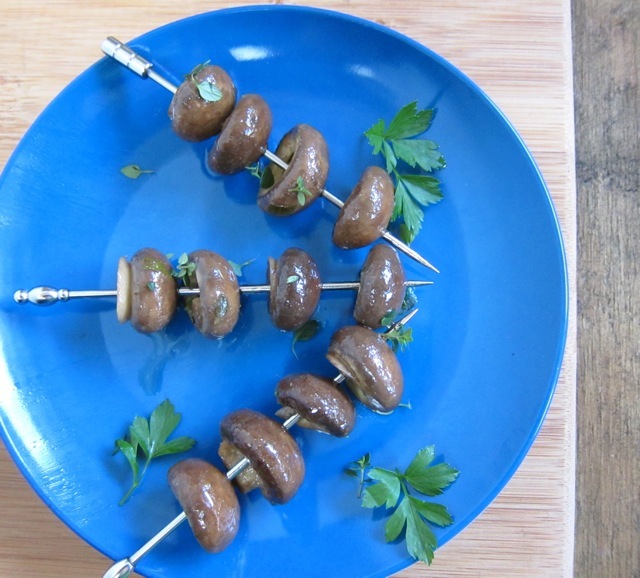 These marinated mushrooms certainly fit the bill. Who needs cheese and crackers when these plump mushrooms, gently simmered in vinaigrette, are on the cocktail table? I decided to opt for criminis instead of the classic white button mushrooms. I threw out the mashed, cooked egg yolk in the original recipe from the Colorado Cache Cookbook, one of those terrific junior-league recipe collections from the 1970’s, and added fresh thyme from the garden and used a good quality virgin olive oil. Serve a plate of these beauties the next time you are enjoying an apéritif with friends and watch them disappear. 1. Using a medium-sized skillet, combine the vinegar, oil, salt and pepper, parsley, thyme, mustard and brown sugar. Bring to a boil while stirring. 2. Add the mushrooms, reduce heat to medium and cook for 5 minutes. 3. Cool, then refrigerate, allowing mushrooms to marinate in vinaigrette for at least 4 hours. 4. Serve, using small cocktail skewers or sturdy toothpicks. Garnish with thyme and/or chopped parsley. The vinaigrette makes a nice dipping sauce. I’ve still got some of those great Jr League cookbooks too! This looks like a wonderful healthy riff on a mushroom app. What a great snack to have around the house. I do not know why you could chop a few up and throw it into an omelette or pasta. My Polish friends have bowl of marinated mushrooms on the table with almost every meal. It just compliments a bunch of foods. There’s something so pleasantly addictive about marinated mushrooms – and they’re light to boot. They fit into my “more vegetables in 2012” eating plan. Delicious! I am going to make these this weekend- cant wait!! Liz these mushrooms are amazing! For once I’m really glad my husband does not like mushrooms! (I don’t have to share!) they certainly won’t last long, I can’t stop eating them! Liz, those mushrooms look wonderful. The perfect flavorful nosh! Oh Yes! I sell pickled creminis in my Farm Booth 🙂 I really like the look of these. I use white wine vinegar in my product, I would like to try your recipe here at the house using Malt vinegar which is my husbands favorite. Great photo too my friend! I’m sure yours are far superior to mine – thanks for the RT! I will give them a try during one of our girls night dinner, easy fingerfoods are always a welcome part of our dinners. Thanks, Toni, and Happy New Year to my favorite nursery – and here’s to France in 2012! These look simple, delicious and versatile! Any leftovers (although I doubt there would be any) would be great in a salad. Looks like a perrrrrfect appetizer for a party! Happy New Year LIz. Love your blog and look forward to more fun recipes from you in 2012!! Thanks, Jenny – happy new year! I’ve got a Junior League cookbook, too!! I’m hosting a small get-together this Friday. I was looking for something to go with my lamb sliders and cucumber spread. This is it!!!! I’ll report back, but I’m sure this will be delightful.